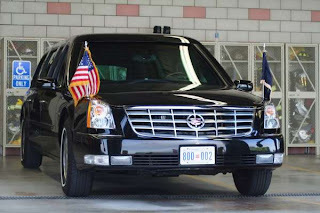 The 2006 Cadillac Presidential Limousine is a hand-crafted and armored version of the Cadillac DTS (DeVille Touring Sedan) stretch sedan for the President of the United States. 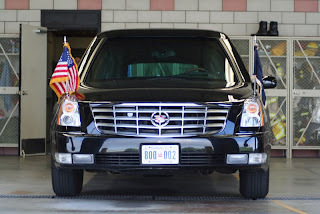 The new Cadillac DTS was first used during the second inauguration of George W. Bush in the January 20, 2005 parade. 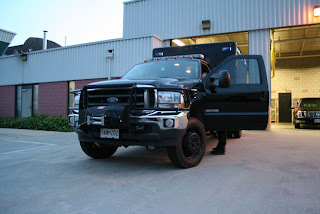 The vehicle was custom built by O'Gara, Hess, and Eisenhart, armored vehicle builders who have been building armored presidential limousines since the 1960s. 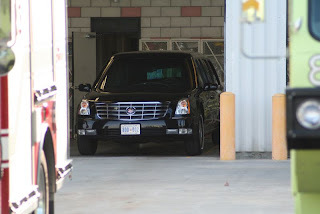 The base platform is a Cadillac DTS, but little of the original vehicle remains. For example, DeVille's flush-style door handles have been replaced by a loop-type design apparently borrowed from the 1992-99 generation Buick LeSabre, doubling as grab-handles for the United States Secret Service agents running alongside the car. Exterior examination suggests that the head/tail lights, and the wreath-and-crest emblem atop the grille are some of the few stock components. 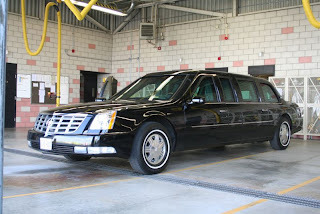 Similar to its predecessor, the 2001 Presidential Limousine, the stretch Cadillac features an executive leather interior with a rear foldaway desktop, an extensive entertainment system featuring a 10-disc CD changer, and adaptive, massaging cushions. The president sits in the rear, facing a console-mounted secure communications panel connected to five antennas mounted on the trunk lid. 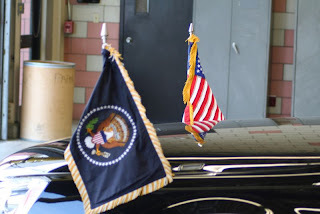 The vehicle has a flag of the United States mounted on the right front fender, and a Presidential flag on the left front fender. 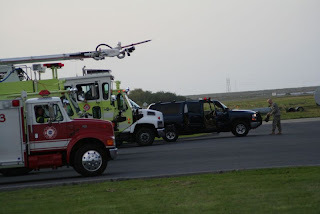 Flush-mounted high intensity discharge (HID) spotlights illuminate the flags at night. Like a standard Cadillac DTS, the presidential limo is said to have a night vision system, but the camera moved to an undisclosed location. The exterior is paneled with five inches of ballistic armor, and is said to be able to withstand anti-tank grenade launchers. The underside of the car is also armored. The windows, which do not open, are transparent armor thick enough to block sunlight, which is the reason the interior is illuminated with naturalistic artificial lighting. The doors require automatic systems to open and the car has a run-flat tire system. 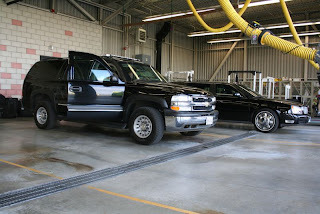 The limousine is also environmentally sealed against chemical and biological attacks. A four wheel drive system to improve traction might also be fitted. 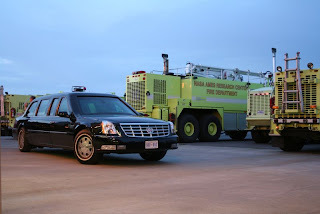 A secret service communications vehicle (toting most of the communications equipment) and a paramedic-equipped ambulance aides the limousine as a part of any presidential motorcade. 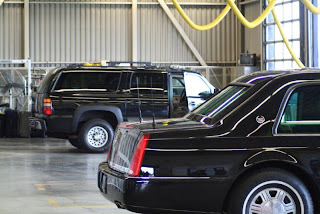 The Presidential Limousine uses the call sign "Cadillac One. 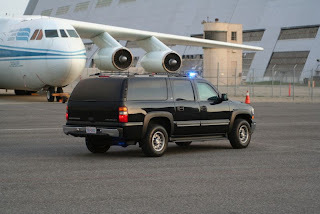 "Cadillac One is transported everywhere the President goes, and is airlifted on domestic and international trips by Air Force transport planes. 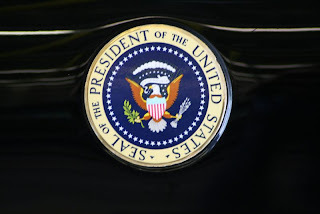 Cadillac One remains amoungst one of the most distinct automobiles in the world with its imposing frame and the Presidential Seal clearly affixed to the rear doors. When the President travels on domestic trips and working international trips, Cadillac One flys the American Flag and the Presidential Flag. When the President however performs a State Visit to a foreign country, the Presidential Flag is replaced by the flag of that country. 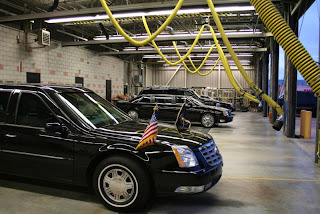 The Vice President of the United States also has his own distinct limousine which is manufactured by Cadallic and it is currently a 2001 DeVille model. It is similar to Cadallic One but instead flys the Vice Presidential Flag and bears the Vice Presidential Seal on the rear doors. 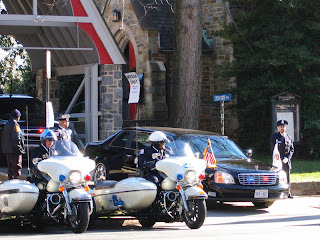 It is not known if it too is transported wherever the Vice President goes or only operates in the Washington DC area. Interior design of the Chevy Volt concept at GM.